Synaptic transmission is a chemical event which is involved in the transmission of the impulse via release, diffusion, receptor binding of neurotransmitter molecules and unidirectional communication between neurons. In a chemical synapse, the pre and post synaptic membranes are separated by a synaptic cleft, a fluid filled space. The chemical event is involved in the transmission of the impulse via release, diffusion, receptor binding of neurotransmitter molecules and unidirectional communication between neurons. The neurotransmitter termination can occur in three ways – reuptake, enzymatic degradation in the cleft and diffusion. In a chemical synapse, the pre and post synaptic membranes are separated by a synaptic cleft, a fluid filled space. The chemical event is involved in the transmission of the impulse via release, diffusion, receptor binding of neurotransmitter molecules and unidirectional communication between neurons. 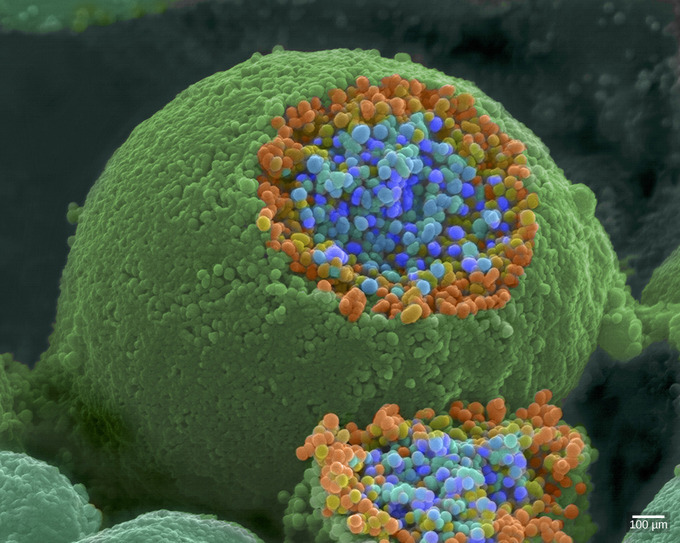 Synaptic vesicles inside a neuron: This pseudocolored image taken with a scanning electron microscope shows an axon terminal that was broken open to reveal synaptic vesicles (blue and orange) inside the neuron. Neurotransmission at a chemical synapse begins with the arrival of an action potential at the presynaptic axon terminal. When an action potential reaches the axon terminal, it depolarizes the membrane and opens voltage-gated Na+channels. Na+ ions enter the cell, further depolarizing the presynaptic membrane. This depolarization causes voltage-gated Ca2+ channels to open. Calcium ions entering the cell initiate a signaling cascade. A calcium sensing protein binds calcium and interacts with SNARE proteins. These SNARE proteins are involved in the membrane fusion. The synaptic vesicles fuse with the presynaptic axon terminal membrane and empty their contents by exocytosis into the synaptic cleft. Calcium is quickly removed from the terminal. Fusion of a vesicle with the presynaptic membrane causes neurotransmitters to be released into the synaptic cleft. The neurotransmitter diffuses across the synaptic cleft, binding to receptor proteins on the postsynaptic membrane. Communication at a chemical synapse: Communication at chemical synapses requires release of neurotransmitters. When the presynaptic membrane is depolarized, voltage-gated Ca2+ channels open and allow Ca2+ to enter the cell. 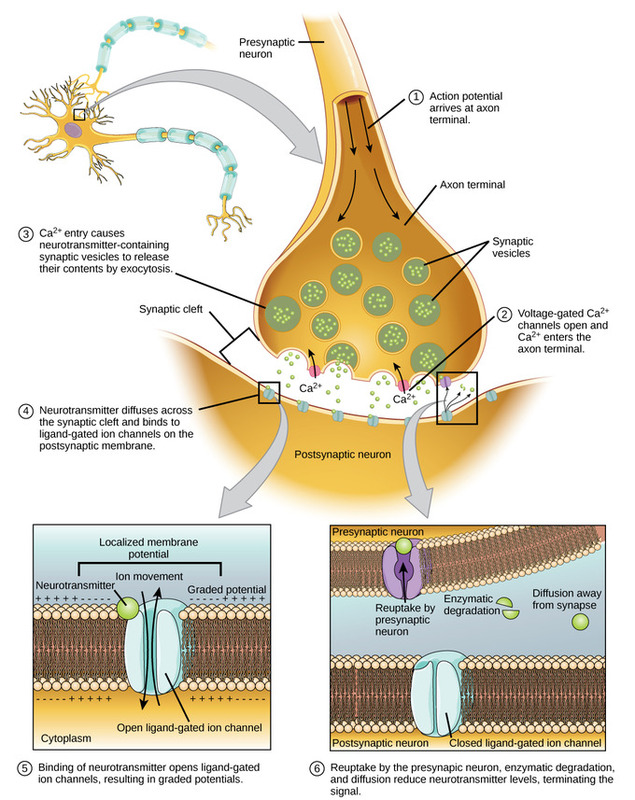 The calcium entry causes synaptic vesicles to fuse with the membrane and release neurotransmitter molecules into the synaptic cleft. The neurotransmitter diffuses across the synaptic cleft and binds to ligand-gated ion channels in the postsynaptic membrane, resulting in a localized depolarization or hyperpolarization of the postsynaptic neuron. The binding of a specific neurotransmitter causes particular ion channels, in this case ligand-gated channels, on the postsynaptic membrane to open. The binding of a neurotransmitter to its receptor is reversible. As long as it is bound to a post synaptic receptor, a neurotransmitter continues to affect membrane potential. The effects of the neurotransmitter generally lasts few milliseconds before being terminated. The neurotransmitter termination can occur in three ways. First, reuptake by astrocytes or presynaptic terminal where the neurotransmitter is stored or destroyed by enzymes. Second, degradation by enzymes in the synaptic cleft such as acetylcholinesterase. Third, diffusion of the neurotransmitter as it moves away from the synapse.